Product #21177 | SKU 041125 | 0.0 (no ratings yet) Thanks for your rating! The Rycote In Vision Stereo Pair Kit includes two In Vision 7 HGMK3 Microphone Holders on a stereo bar. InVision INV-7HG MKIII Stereo Pair Kit is a vibration-resistant, low-noise suspension system designed to mount paired microphones for stereo recording. The Kit comprises two of Rycote's patented vibration-reducing Lyre suspensions mounted on a rigid, slotted stereo bar. The dual InVision INV-7 HG MkIII Lyre webs used in the Stereo Pair Kit can accommodate larger shotgun mics from 19 to 25mm in diameter, and up to 300mm long. 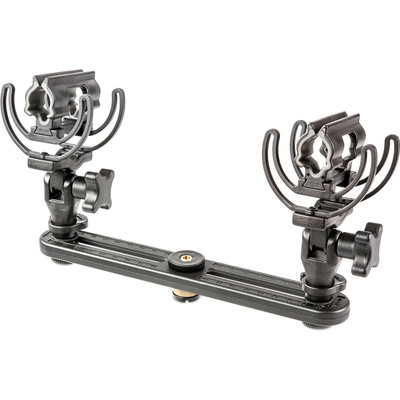 The spacing between the two webs, and thus between the two mounted microphones, is quickly and simply adjustable from 40 to 200mm on the slotted bar by loosening a brass wheel under each Lyre and moving it laterally as required. A star-shaped knob underneath each Lyre also allows each mic to be rotated and/or inclined, and then secured once optimal stereo imaging has been achieved.